FITC has since the tenure of Lucy Newman, extended the 2007 change in corporate identity to full rebranding and refocusing, as a firm that provides training, consulting and research services. Later in 2019, Dr. Lucy Newman will serve out her second term as Managing Director and Chief Executive Officer of FITC. For those who are familiar with the firm, either during her tenure, or before her leadership of the institution, the accomplishments of this self-effacing, silent achiever, deserve the spotlight. What she has provided FITC in about the last 10 years has been inspirational leadership, leading a firm to overcome its challenges and delivering value to its diverse stakeholder base. It was while using FITC's library for the research for her doctoral dissertation as a library user in 2007, that Newman first encountered some of the challenges the institution faced. Therefore, when she first learnt from further research of key terms in the advertisement that the MD/CEO vacancy a former colleague had informed her of was FITC, her first reaction was reticence, because as at then, she was doing well at her former employer, a 'global big 4' professional services firm. But as she would later discover, it was during the third effort at finding a CEO for the firm that she became aware of the vacancy. A sense of mission later replaced her reservation about the job as she progressed in the recruitment process and appreciated the mandate of the organisation. After a series of successful interviews, following her application, she was selected for the role. FITC, then, had rented the 2nd to 5th floors at the Shippers Council in Apapa, Lagos. Logistically, this location somewhat disconnected the firm from the financial services institutions it served on the other side of town. Upon her resumption in 2009, she observed that using the facility of the firm was increasingly becoming not a very pleasant experience due to traffic, flooding and decaying facilities. FITC has since the tenure of Lucy Newman, extended the 2007 change in corporate identity to full rebranding and refocusing, as a firm that provides training, consulting and research services. Its institutional membership base is the Nigerian Bankers Committee – the umbrella associations of the Central Bank of Nigeria (CBN), the Nigerian Deposit Insurance Corporation (NDIC) and all licenced banks. FITC also provides continuous education programmes for directors of financial institutions. Over the last decade, the scope and footprint of its programmes has tremendously expanded under the Management headed by Dr. Newman. FITC now produces up to 180 courses yearly, which are increasingly delivered in Nigeria, other West African countries, and other traditional jurisdictions, including the United Kingdom, United States, United Arab Emirates, with participation drawn from Nigeria, Uganda, Tanzania, Mozambique, Ghana, Senegal, Gambia, Liberia, Kenya and Ethiopia. Cumulatively, the firm has trained over 65,000 participants from these countries since its inception in 1981. FITC works with diverse stakeholders and clients across the financial system, including banks, development finance institutions, microfinance banks, insurance firms, mortgage institutions, capital market operators, businesses in the pension industry. During her interview with Financial Nigeria last July, Dr. Newman disclosed that FITC had almost tripled its net-worth and the number of participants in the organisation's training programmes had also increased by about 65 percent over her tenure, with her 10-year tenure accounting for about half the cumulative participants from FITC's inception, 37 years ago. From its second and then restrictive office accommodation, Dr. Newman led FITC to acquire, remodel and move into its own property in Yaba, Lagos in July 2010. FITC House, now located at 164/166, Murtala Mohammed Way, Ebute-Metta, Lagos, is well-branded to reflect a very dynamic institution that is ready to serve its clients and deliver value to its stakeholders. But the firm had wanted to also develop a campus site. It's efforts in this regard had met a series of setbacks before Lucy Newman came into the saddle. FITC had actually lost two properties between the mid-1990s and 2004. It also almost lost the land it acquired in Lekki, to deliver on its long-held aspiration for a campus. However, much progress has now been made on FITC Lekki Campus, a project situated on 6.48 hectares of land. The vision for the Lekki Campus is to have a green environment with modern designs that provide a high-quality-of-life experience for habitants and visitors. So far, the land-clearing, fencing and exterior interlocking roads have been completed. Perimeter lighting and basic requirements already exist, while external landscaping has commenced. All these have provided the foundation required for the next phase of development, given a well-established presence. The campus is to provide a minimum of 3- to 4-star accommodation for up to 150 participants, conferencing, staff quarters, utilities area and recreation. It is FITC's aspiration that has been in the works over the past almost 2 decades. The FITC Board, Management and Staff are particularly delighted about the progress on this project in recent years. Under Dr. Newman's leadership, the directors' training programmes – known as the Continuous Education Programme (CEP) for Directors of Financial Institutions for the domestic version and the International Continuous Education Programme (ICEP) for the international version – have intensified and expanded to provide board leadership training for a wider pool of financial institutions locally and internationally. Apart from the CBN that has been collaborating with FITC for 13 years, other variants of CEP partners are the Mortgage Bankers' Association of Nigeria (MBAN) for 10 years and the International Finance Corporation (IFC) from 2011-2018. FITC's continental role has also included being an Affiliate Member of the Africa Corporate Governance Network (ACGN), from the ACGN's inception in 2012. One of the latest milestones in FITC's training programmes, has been the accreditation of 10 out of the 15 courses it submitted to the Finance Accreditation Agency (FAA) of Malaysia, an agency affiliated with Bank Negara and Malaysian Stock Exchange, and like FITC, chaired by a Deputy Governor of Bank Negara. The accreditation of the courses has provided independent assurance of quality of the applicable courses as offered by FITC in its training portfolio. It is expected that the remaining five courses will achieve accreditation within the remaining months of the current CEO's tenure. The programme accreditation has put FITC in a better position to continue to deliver on its commitment under the FSS 2020 plan to transform the Nigerian banking system. “Dr. Lucy Newman is a modern leader, who focuses on sustainable delivery of the corporate goals and stakeholders' values. She is adept at building a positive team spirit as well as nurturing value-based relationships. 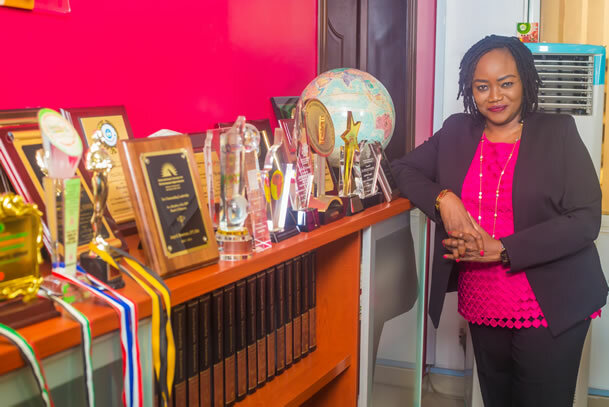 “This insight into her leadership derives from five years of successful implementation of the media partnership between FITC and Financial Nigeria. Over this period, I have interviewed her three times for Financial Nigeria magazine. “Moreover, some of our readers, who are long-term stakeholders of FITC, have spontaneously spoken to me about their admiration for her. They noted the quality of her work and leadership, as reflected on the improvements in the continuing education programmes for directors of financial institutions, which FITC is mandated to provide. “Dr. Newman is highly driven. But she is as well a consummate team-player. My official interactions with some members of her executive team reveal their appreciation for her leadership style. As I understand it, she has transformed FITC into a family of people that are motivated to put in their best for the institution and succeed in both their careers and personal lives. Those were the words of the testimonial that Jide Akintunde, Managing Editor, Financial Nigeria, provided the latest edition of Financial Sector Pinnacle (FSP) – an annual serialised publication of FITC – on the leadership of Lucy Newman. Two other testimonials, excerpted from the latest FSP, further attest to the quality of her leadership. Tokunbo Martins, Director, OFISD, CBN: “I worked with Lucy on the Board of FITC while she was the Managing Director/CEO and I was the Director of Banking Supervision from 2012 to 2016. I found her a most forthright, hardworking and progressive leader. Toyosi Bello, Former Staff of FITC (2009 - 2016): “FITC became one of the best places to work during Dr. Lucy Newman's tenure with her exemplary leadership style and good industry knowledge. She introduced policies and creative recommendations that brought about process improvements and employee satisfaction company-wide. As a matter of fact, FITC became more visible in its service offerings to deliver its core mandate within and beyond Nigeria during her tenure at FITC. FITC has received several awards and recognitions, locally and internationally, during Dr. Newman's two terms of five years each at FITC. Among these recognitions is the Great Place to Work (GPTW) Award, which FITC received in 2012 and 2015. Some other awards – from a large collection – are the West African Award for Training Excellence and Innovative Services (2012); the International Award for Service Quality (Gold Category) (2012); Africa's Leading Training & Research Services Provider at the 2018 African Quality Achievements Award. She has also been bestowed several personal honours for her work. She was conferred with Fellowship of the Nigerian Institute of Management (NIM) in 2012. She was also elected the 2012/2014 International Director of the International Society for Performance Improvement (ISPI), becoming the first African on the global board of ISPI in the 50th year of the organisation. Dr. Newman prefers her accomplish-ments to be chronicled by others. One high profile report, which chronicles her achievements, was “Branding Beyond Logo and Colours: A Case Study of FITC's Evidence-based Transformation.” It was published as the 13th chapter of a 2015 book, “Cases on Human Performance Improvement Technologies,” authored by J. Stefaniak, an American scholar. FITC is the only African case study in the book, which is now used by tertiary institutions offering human performance technology in the United States. As Dr. Newman looks forward to life after her work at the FITC later this year, she says she is not about to rest on her oars. “I will, within the remaining time, be supporting the FITC Secretariat and Board Chairman, in getting those who joined the FITC Board, following the just concluded inauguration of the FITC 2018/2020 Board, settle in,” she told FSP. She outlined her other commitments to include working with her colleagues in Management on the remaining stages of FITC Lekki Campus Milestone 3. She also plans to firm up a peer mentoring relationship in Africa for FITC. And despite the independent assessment of her tenure, she plans to write a report on her stewardship to be presented to FITC institutional members, other stakeholders and the media. She said she will continue to network and advocate for the FITC brand and also work with colleagues on delivering on FITC's projects till her last day in office. Characteristically, Dr. Newman would not publicly disclose her post FITC plans, preferring to maintain focus on her current role, until she leaves the firm. We surely wish her the very best in whatever she chooses to do next.